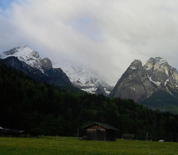 BMC Garmisch, also referred to as USAG Garmisch, is located in Garmisch-Partenkirchen, Bavaria, Germany. The garrison provides support to three major organizations - The George C. Marshall Center for Security Studies, the NATO School in Oberammergau and the Armed Forces Recreation Center Edelweiss Lodge and Resort, a DOD owned hotel. The base is situated in the Bavarian Alps along the German/Austrian border in a mountain resort town. You can experience breath taking views and abundant opportunities for outdoor recreation year round. This BMC Garmisch directory features the critical info you’ll need to navigate through the many facilities and recreational opportunities available on base.